Ant Gel bait for use in side home or office. 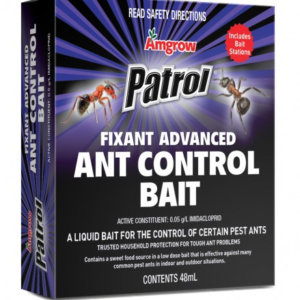 Patrol Fixant Advanced Ant Control Bait safe and effective way to control ants. Ant poison which contains imidacloprid, is placed safely in a bait station preventing access from pets and family. Patrol Fixant Advanced Ant Control Bait lures the ants to the bait, the ants feed on the poison baits which ants take back to the nest. The ant colony is then affected by the bait that spreads throughout the colony of ants and poisoning resulting in the killing of all the ants in the nest as well as the queen. Pull the External Trap Cord to Set. Ideal trap for use in home or office where you don’t want to see the end result. The rodent is trapped inside and the trap can be disposed of easily. 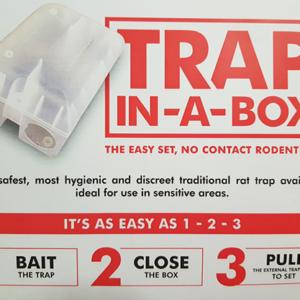 The trap is durable and is make of a clear plastic this makes it easy to identify and inspect the rat or mouse that has been caught.